strong woman . . . Sometimes, it’s better to be late than never! That’s what I was thinking when the idea came to me to watch the “Hunger Games” movies this weekend while my daughters, M. and C. were visiting for the weekend. As you know, I’m recuperating from a broken ankle that required surgery less than a week ago. Things have calmed down quite a bit since the post-op machinations of narcotic painkillers, fluid in my lungs from surgery and learning to inject myself with blood thinners to prevent clots. I don’t know where the idea came to me to watch Jennifer Lawrence play the central role of Katniss Everdeen in the “Hunger Games” films. Both movies provided a dramatic, engaging backdrop to the weekend–we played them continuously after watching two foodie movies first: “Les Saveurs de la Palais” and “Mostly Martha.” The French film was about a woman who was recruited to be the personal cook of President Francois Mitterand for two years and was just delightful. The rampant sexism of the men from the “main kitchen” and elsewhere was familiarly shocking. There were flashbacks from a year cooking in Antartica after the Palace stint, earning enough from the two for her to go and look for land to start a truffle farm in New Zealand. Played by the famous French actress, Catherine Frot, it was a feast for the eye (her jewelry and clothing) as well as the palate (truffles sliced on truffle-buttered toast for the President sitting at the table in the dark kitchen,) a time before his diet had to change due to prostate cancer. Even more to the senses than her appearance or the delectable food images was her self-confidence in being placed in the role, carrying it out against the odds of the male chefs casting aspersions, shouting, not letting her use equipment or fridge space; she did it all with aplomb, tenacity and grace. Loved it! If you like food and strong women, you can find the film on Netflix. “Mostly Martha” featured a central female character who was almost the opposite of the French chef in the first movie. She prevails in the end, though, surmounting her own neurotic habits and tenets about life to rescue her niece, acknowledge how kind Mario, the man who loved her is, and to make huge shifts in her life to follow the path of happiness that Life pushed her to choose, even as she rebelled against it due to her habit of being difficult and unhappy. Then, we come to Katniss Everdeen, who fiercely volunteers herself to replace Prim, her much younger sister, who is selected as one of the Tributes from District 12. I can’t believe that we didn’t see these earlier but even when my fifteen year granddaughter, A. watched them at the time they came out a few years ago, I was too scared to watch teenagers thrust into “games of death.” The reason I wanted to watch them this weekend was Jennifer Lawrence. I am a movie buff from way back and have seen “Silver Linings Playbook” and “American Hustle.” I’ve also watched her handle herself at the Oscars and Golden Globes. 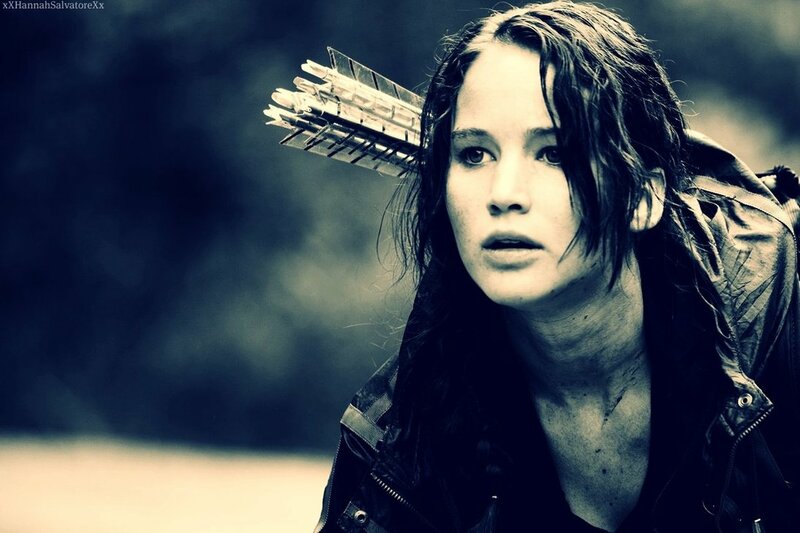 After watching the HG films this weekend, I can’t imagine any other actress embodying the role of Katniss Everdeen, can you? You may be wondering why I’m bothering to write this post while I’m concentrating on healing my injured leg. It’s because having possession of oneself, being strong in strange settings beyond one’s control, and overcoming overwhelming obstacles is the most positive energy I can surround myself with. Besides, it’s a lot of fun.